The battle for the Earth of Injustice has begun in earnest. As Wonder Woman fights her alternate universe countepart for leadership of the Amazons, The Harley Horde raid one of Lex Luthor's old armories. They aren't looking for weapons - they're looking for tools to keep the people caught in the crossfire safe. While I love Tom Derenick as an artist, I fear he was the wrong choice for this particular issue of Ground Zero. Derenick's animated style would normally be a good fit for a story focused on Harley Quinn. 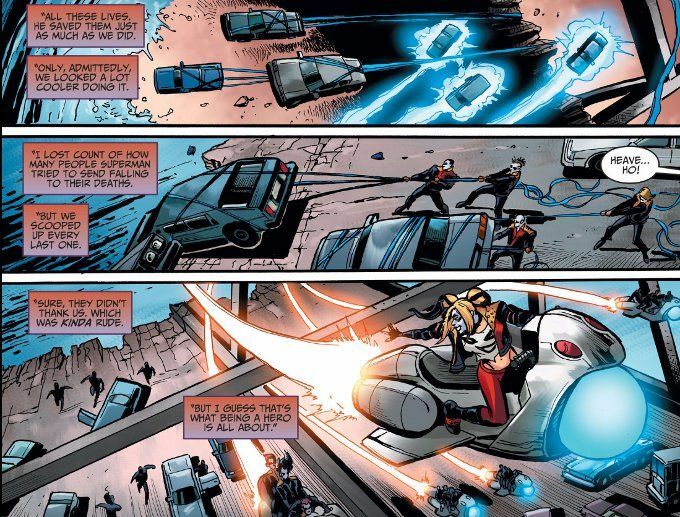 Sadly, it doesn't really work here, where Harley is narrating most of the action and trying to be serious. The Wonder Woman fight suffers the worst in this regard, looking more like a slapstick sequence than a brutal battle between two Amazons. Despite this disparity between the art and Christopher Sebela's excellent script, this issue remains a good read.